Child Car Seats Laws Around The World - Which? Heading abroad for a family holiday, but unsure about the local rules on car seats? Find out all you need to know before you jet off. UK law states that children must use a child car seat until they're 12 years old or 135cm/4ft 5in tall, whichever comes first. But the rules and regulations for other countries can be different. To save you time and hassle, we've compiled the child car seat rules and regulations for some of the most popular holiday destinations, with the help of international car seat experts from other consumer organisations. We'll be adding more taxi information as and when we get it, too, so check back each time you head off on a trip to stay fully up to date. Jump straight to our Which? child car seat laws quiz to test your knowledge on the rules for using a car seat safely around the world. Need a car seat? A Best Buy child car seat provides good protection from both front and side-impact crashes. Rules: If you're heading to Canada, you must check the regulations required for each province. There are 10 different legislations for each province. Google 'child safety guidelines' and the name of the province for more information. Can I use a UK car seat? No. A child car seat must have the National Safety Mark. Rules: Children should use a child restraint seat suitable for their height and weight until they are 135cm. The seat has to be approved to UN R44 or R129. Exceptions: You are not allowed to have a rear-facing seat in the front seat unless the airbag is deactivated. It is the responsibility of the driver that every child below the age of 15 is using the right safety equipment (car seat or seat belt depending on height), and the driver will be penalised if not. Is a car seat required in a taxi? A child can travel in a taxi without a child car seat if there isn't one available. The child has to sit in the back seat. and if he or she is three years or older the car's seat belt has to be used. Rules: All children under 10 and less than 135cm tall must use an UN R44/R129-approved child car seat. A child between 135cm and 150cm can use a booster seat if needed. You can transport children in the front seat in a child car seat if there is no back seat or no seat belts on the back seats, or all the back seats are taken up with car seats already or the back seats are temporarily unusable. A baby can travel on the front seat in a rearward-facing car seat, but only if the airbag is deactivated. Is a car seat required in a taxi? No, there is no requirement to use a car seat in a taxi. Rules: Regulations require child restraints approved to UN R44/R129 for children less than 150cm tall or younger than 12 years old, whichever comes first. Is a car seat required in a taxi? Yes, children are required to use car seats in taxis. Rules: All children under 150cm in height or 36kgs (79lbs) in weight must use a child-restraint system suitable for their height and weight approved to UN R44 or R129. Children can sit in the front seat as long as they are using the correct child restraint for their height and weight, but it's illegal to use a rearward-facing child car seat in a passenger seat with an active airbag. There is now a penalty for drivers who place a rearward-facing child car seat in the front where there is an active airbag. You may receive at least three penalty points on your driving licence. Drivers have a legal responsibility to ensure that all passengers under 17 are appropriately restrained in the vehicle. Children should always travel in the back of the car, away from active airbags and the dashboard. Is a car seat required in a taxi?Taxi drivers are exempt from supplying child car seats, so you don't need to use. Rules: All children under 150cm in height, regardless of weight or age, must use a UN R44/R129-approved child car seat. A baby can travel on the front seat in a rearward-facing car seat, but only if the airbag is deactivated. Is a car seat required in a taxi? There is no requirement to use a car seat in a taxi. Rules: All children up to 135cm must use an UN R44 / R129-approved child car seat. Is a car seat required in a taxi? If there's no car seat present in a licensed taxi (identified by the blue licence plates) children older than three years may sit in the back seat using the adult seat belt and children under three years can sit in the back seat without a seat belt. The front passenger seat can only be used by children who are more than 1.35m tall, secured with the adult seat belt. Rules: All children under 12 years old and less than 135cm tall must use a UN R44/R129-approved child car seat. You can transport children under three years old in the front seat in a child car seat as long as the airbag is deactivated. Exceptions: If a car does not have seat belts in the back seat, a child can go in the front seat with the correct car seat and the airbag deactivated. If you want to transport three children in the back seat, but you only have room for two car seats, the oldest child may use the car's seat belt – we'd suggest the middle seat. Rules: It’s compulsory to transport children under 18 years old and less than 135cm tall in a UN R44/R129-approved car seat in the back seat of the car. Exceptions: when a car only has two seats, or when it’s not possible to fit more car seats in the back seats, then one car seat can be installed on the front seat, as long as the air bag is deactivated. If you're caught without a car seat, the police may ask you to wait until somebody brings a car seat, or the children are transported in another car with a car seat, or a taxi. The fine is around 300 euros. Is a car seat required in a taxi? Children are not required to use car seats in city areas, but if you land at an airport and your journey is out of the city centre, you'll need a car seat. Rules: Each state has its own child seat laws and travellers must comply with the laws in each state that they are travelling through. The legal restrictions vary a lot between states. For example: South Dakota requires child seats for children four and younger and less than 40lbs, whereas Tennessee requires child seats for those aged eight and younger and includes specifications for rear-facing, forward-facing, and booster seats. All child seats on the market must pass the requirements (including crash tests) of FMVSS 213. The Insurance Institute for Highway Safety keeps an up-to-date table of all the state laws, so check here before you travel. Is a car seat required in a taxi? In most states, taxis are exempt from car seat laws, with the exception of California. You'll usually find the car seat approval label on the back or the bottom of the car seat. Take a look at the picture above to see what it looks like. It will either say ECE R44 or R129. See which car seats did well in our crash tests in our child car seat reviews. The car seat regulations in the table above apply to everyone driving in that country, including tourists. And while it's debatable how strictly these rules will be applied to tourists, we still think it's worth knowing them. See how much you already know and what you've picked up from reading our advice, by taking our quick quiz that tests your knowledge on car seats laws, both at home and away. Which? : Do you know your child car seat laws, home and away? 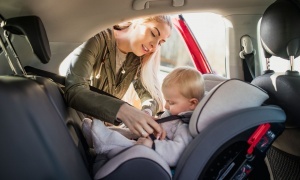 Whether you’re heading off abroad for your holidays, or staycationing for the summer, if you’ve got kids and you’re getting in a car, you’re going to need a child car seat. But how good is your knowledge on the rules for when, where and what age? You're piling into a taxi to the airport, and in your hurry you pack the child car seat in the boot. Can you be fined for not using a child car seat for your own children in a taxi? This year you’re off to Brittany for baguettes and brie. Your 10-year-old son is 140cm tall. Does he need to use a child car seat? For next year’s holiday you’ve got your sights on Vegas, baby. But can you use an EU-approved child car seat, bought in the UK, in the USA? Car seats laws are the same in the USA and Canada. Yes or no? Your mum and dad are ferrying your children in your car for a day out and they forgot to bring the child car seat. Who gets fined when the police notice and stop them? You're about to hop in the car and head off on holiday in the UK with the kids; by law you have to use a car seat until your child reaches 12 years old, or 150cm tall. True or false? Now that booster seat approval rules have changed, you can’t use them for children who weigh less than 22kg. True or false? Travel car seats: bring your own or hire? If you're hiring a car abroad for your family, you'll need to decide whether to travel with your own child car seat or pay for one from the car hire company. We've heard some horror stories from parents about the travel car seat they've been offered by car hire companies on arrival. These range from turning up to travel and finding no baby car seat available, to having to travel with a toddler car seat that’s the incorrect size for a child. If you need to pick up a car abroad, check the cost of hiring a child car seat car seat in advance. It could be cheaper to take your own. Even if you have to pay extra luggage charges as a result of bringing your own car seat, it may not be that much more expensive than the travel car seat hire fee. Bear in mind that car hire companies normally say the provision of car seats is subject to availability. The only choice of travel car seat could be one that’s the wrong size or car seat group for your child. When you're given the car seat, make sure it's suitable for the age and weight of your child by checking the label on the back. If it's been a while since you've bought a child car seat, give yourself a refresher before you go with our car seat weight groups. You might be offered a seat that isn’t in the best condition. Check the seat before you drive off to make sure that the harness isn't damaged or worn and the buckle works properly. Hire a travel car seat and you might end up with an older model that doesn’t have the same safety innovations as newer models. You could also end up with a Don’t Buy car seat. It could be a seat that we don’t recommend because of serious safety concerns. If you are going to hire a travel car seat, phone or email ahead to see what models of car seat are available. You’re unlikely to get help fitting a travel car seat, so if you are going to hire one, make sure you make sure you have our guide to how to fit a child car seat handy. In the unlikely event that it has been fitted for you, use our car seat fitting checks so you can double check and give yourself peace of mind that it has been installed properly. Remember - even a Don't Buy car seat that's fitted correctly is better than no seat at all. Should I buy a travel booster seat or bring my full-sized car seat? 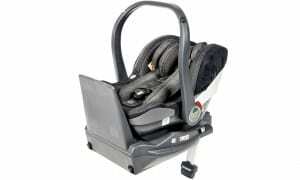 When you’re looking for a portable car seat for travel it can be tempting to go for a booster seat for an older child. They are smaller and lighter to pack than a full-sized car seat. But our car seat experts and many others warn that these backless cushions are not the best way to transport children. If you’re looking for a travel car seat for a toddler, we’d recommend using a high-backed booster seat instead, whenever possible. The booster seats we've tested have not proved as safe in our crash tests as high-backed booster seats with a full-length back and 'wings', as these provide extra protection for the head and chest in a side-impact crash. Whatever you choose to do following our advice, please remember than any child car seat is better than no car seat at all, both for safety and to prevent you breaking the car seat laws of the country you’re travelling to. Children under three can travel without a child car seat or seat belt, but only on the back seat children aged three or older can travel on a rear seat without a child car seat if they wear an adult seat belt. If you have a child under three, some experts feel the best option is to sit the child next to you on their own seat (if they are able to) rather than holding them on your lap, which isn't safe. In a serious crash, an adult's arms would not be able to hold on to a child, and your body weight could crush them. Our advice is to call the taxi company in advance. See whether it has an appropriate car seat available to use, or check to see if you can use your own (if taking it with you). For young babies, where it's not possible to sit them on the seat and a car seat isn't an option, it may be possible to keep them in their pushchair in the back of a black London taxi (Hackney carriage). Booster seats - are you breaking the law? Can I fit three child car seats in my car?